10 Simple Suggestions To Engrave on A Medical ID Bracelet. Deciding to wear a medical ID bracelet can be a life saving decision. Just as important is what text you have engraved on your bracelet. 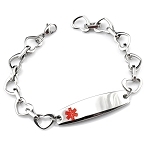 There are no right or wrong answers when choosing what to engrave on a medical ID bracelet. 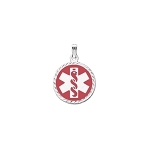 However, it is essential to take certain things into consideration in order to make it easier for a paramedic or an emergency medical technician to help you during a critical situation especially in the event that you are unable to communicate for yourself. 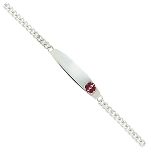 Depending on the item you purchase, you may be able to engrave on one side or both sides of the bracelet (or necklace, pendant or watch). 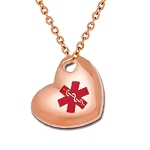 On each Elegant Medical Alert product page, you will see the amount of characters you may engrave listed above the "Engrave Text" box. Usually, you may engrave up to 40 characters of text. However, to avoid having the font from being too small to read, you will have to reduce the amount of characters for smaller items with less surface space. 1. Be sure to list your major medical condition or conditions, such as DIABETES or EPILEPSY. 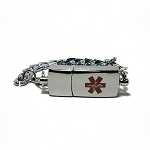 If you want to list your whole medical history, you can wear a USB medical alert bracelet. However, for most other traditional bracelets you should use the limited space wisely by only listing the items that are significant enough to be brought to the attention of the first responders. 2. Do you have any food or drug allergies? It's important to list allergies such as PENICILLIN or NUT ALLERGY. You can also list EPI PEN as well. 3. Take any medications regularly? You may want to list if you take BLOOD THINNERS or you can be more specific like COUMADIN or WARFARIN. 4. Consider listing at least one emergency contact phone number. For instance, it can say SUSAN 555-123-5555 or DR. SMITH 555-123-4444 or even MOM 555-123-3333. 5. 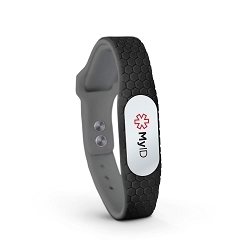 Are you engraving the bracelet for a child with AUTISM or an adult with ALZHEIMERS? If so, you may want to include the phrase, IF LOST CALL... followed by a contact phone #. 8. 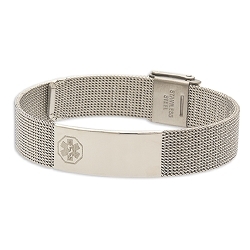 It's great if you can fit your name on the bracelet, but it is not essential. While it is nice to have your name on it, it is more important to list ailments, medications and a contact phone # that someone can call in case of an emergency. 9. If you carry a medical ID card in your wallet or purse, you may engrave SEE WALLET CARD so medical personnel or a caregiver will know to read the card to be advised about your medical information. 10. Finally, you may also ask your doctor what he or she recommends you have engraved on your medical ID. Have any comments or suggestions? Feel free to share! It's great that you are getting ideas from this paragraph as well as from our discussion made here. I have an abdominal aortic aneurysm, as well as, 4 heart stents from a heart attack. Should this be included? What if you have multiple life-threatening allergies? Do you need lots of tags, or what? 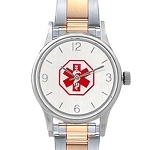 Elegant Medical Alert: Depending on how much text you need to engrave and the amount of space available, we may be able to fit several allergies. If you find that you need more space, you may want to consider a USB or QR Code item so you can list a lot more information, including your full medical history. My girlfriend's bracelet says allergic to Carbocain, then says - P. What the heck is the P. for? Birdi, the "P" is most likely for "peripheral". Peripheral being a way to utilize the Carbocain. What about CVA , stroke? Breast cancer survivor.Allergic to Percocet. Hi, I am debating how to word my heart catheterization. Would it go under heart patient or?? Heart catheterization is pretty long. Hi because i had gastric bypass i can only have chest compressions. Is there an abreviation for this? I have just been diagnosed with Alpha-gal allergy Where you are allergic to all mammal meat and byproducts. Including vaccines, gelitin capsules, whey and many other meds and foods that contain the alph-gal carb. Its not well known; tick born allergy. But I'm not sure if I put "alpha-gal allergy" 1st responders would know what it is or what meds use beef or mouse byproducts as preservatives. Time is a critical thing during anaflaxis. What should I write? I have one kidney on the left, how would I word that on my bracelet? Hello, I have BPD, borderline personality disorder and I also have depression, Anxiety. Asthma, history of Cellulitis that make my temperature go very high, I can't have blood transfusion because of religious reasons. I have learning disability I am Allergic to codeine, aspirins, cats, dust, some hand cream, some soap. Last time I fell over I went into hyperventilation. I can't always speak up. I just have my spleen removed and was advised by doctor to wear a medical alert bracelet. What should I have engraved on it?? My daughter was just diagnose with juvenile rheumatoid arthritis, she on methotrexate and is allergic to penicillin. 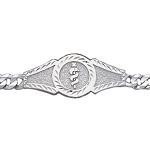 Should i get her mefical bracelet? 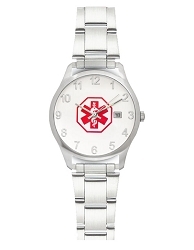 Since your daughter has a PCN allergy, it would be wise to get a medical ID bracelet for her. If you need any help selecting a bracelet for her, please contact customer service at [email protected] or call 1-888-549-4347.